The oft-rumored Nvidia GeForce GTX 1070 Ti has finally been unveiled in full, and it’s a beast of a GPU. The Nvidia GTX 1070 Ti comes sporting 2,432 NVIDIA CUDA Cores, well above the original Nvidia GTX 1070’s 1,920 core count. The new Titanium version of the GTX 1070 also matches up clock speed-wise with the Nvidia GTX 1080 at 1,607MHz, though, the boost clock frequency still tops out at 1,683MHz. The Nvidia GTX 1070 Ti also sticks with only 8GB of GDDR5 memory. 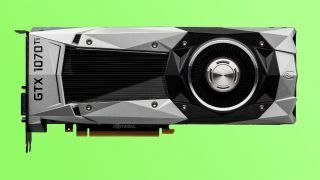 We were honestly hoping it might get a dash of GDDR5X memory or the 11Gbps G5X memory that super charged the later refresh of the Nvidia GTX 1080. Thanks to using the same 5-phase dual-FET power supply and copper vapor chamber cooling that was originally seen in the GeForce GTX 1080, the GTX 1070 Ti should see plenty of head room for overclocking while keeping cool. What’s most impressive about the Nvidia GTX 1070 Ti Founders Edition (FE) is its $449 or £449 (about AU$580) price isn't too far off from the Nvidia GTX 1070 (FE) that costs $399 (£379, AU$699). Based on specs, this new graphics card should also far surpass the $469 (£419, AU$699) AMD Radeon RX Vega 56. Of course, there will also be a ton of vendor editions from the likes of Asus, MSI, EVGA and the like that will potentially be more affordable than Nvidia's own official edition. The Nvidia GeForce GTX 1070 Ti will be available worldwide on November 2. Stay tuned for our full review in the coming week.